Antiangiogenic therapies inhibit the development of new tumor blood vessels, thereby blocking tumor growth. Despite the advances in developing antiangiogenic agents, clinical data indicate that these drugs have limited efficacy in breast cancer patients. Tumors inevitably develop resistance to antiangiogenics, which is attributed in part to the induction of intra-tumoral hypoxia and stabilization of hypoxia-inducible factor 1α (HIF-1α), a transcription factor that promotes tumor angiogenesis, invasion, metastasis, and cancer stem cell (CSC) self-renewal. Here, we tested whether inhibiting HIF-1α can reverse the stimulatory effects of antiangiogenic-induced hypoxia on breast CSCs. 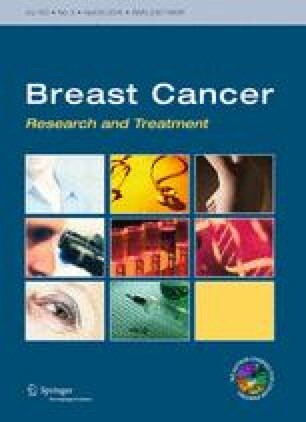 Breast cancer cells grown under hypoxic conditions were treated with the dual topoisomerase-1 (TOPO-1) and HIF-1α inhibitor camptothecin and assessed for their CSC content. In a preclinical model of breast cancer, treatment with bevacizumab was compared to the combination treatment of bevacizumab with CRLX101, an investigational nanoparticle-drug conjugate with a camptothecin payload or CRLX101 monotherapy. While exposure to hypoxia increased the number of breast CSCs, treatment with CPT blocked this effect. In preclinical mouse models, concurrent administration of CRLX101 impeded the induction of both HIF-1α and CSCs in breast tumors induced by bevacizumab treatment. Greater tumor regression and delayed tumor recurrence were observed with the combination of these agents compared to bevacizumab alone. Tumor reimplantation experiments demonstrated that the combination therapy effectively targets the CSC populations. The results from these studies support the combined administration of dual TOPO-1- and HIF-1α-targeted agents like CRLX101 with antiangiogenic agents to increase the efficacy of these treatments. The online version of this article (doi: 10.1007/s10549-015-3349-8) contains supplementary material, which is available to authorized users. This study was supported by Cerulean Pharma Inc.
MSW has financial holding and is a scientific advisor for OncoMed Pharmaceuticals, Verastem, Paganini, and MedImmune and receives research support from Paganini, Dompe Pharmaceuticals, and MedImmune. SE, DL, and CGP have ownership interest (including patents) in Cerulean Pharma Inc. SJC is an employee of MedImmune.